Continuity mistake: After Jet Li has arrived in France and has left the cab, he is walking up a road which seems like China Town to find the shop with dragon in the window. As he arrives near the shop a prostitute with a long black jacket and red hair is standing and talking to a man wearing jeans. Then Jet looks at the picture and then at the dragon, the camera angle changes and as Jet is about to walk in you see the same woman standing against the wall and the man has done the Jet Li vanishing act. Continuity mistake: When Jet Li comes out of the hotel room after retreiving the tape of the execution, 3 men run at him from one direction and Inspector Richard from another. Inspector Richard fires 2 rounds, but then all 3 men fall down. Continuity mistake: When Bridget Fonda is hooked to the steel pipe in Richard's office, she is gasping for air. Then the camera angle switches, and if you listen carefully you can hear that her gasping just stops. Nobody can get their breath that fast. Visible crew/equipment: In the scene on the boat when Jet is being chased by Inspector Richard's men, Jet grabs a chair and smashes the window as an escape. Just before the chair hits, you can see where the glass was scored (in a huge 'X' shape) to ensure the glass breaks fully. Continuity mistake: Just before Jessica eats the rice she puts her hair behind her ears. Throughout the time she is eating the rice, her hair changes from behind her ears to down each time the camera switches between her and Jet Li. Continuity mistake: Near the end when Jet is in the police station and is fighting against all the black belts, at one point, 3 fighters take their stance against Jet. You can see the edge of the gym mat right behind Jet. As the 3 guys advance, Jet defends and backs up for at least 20 feet but he never reaches the end of the mat. Continuity mistake: When Jet Li is against the 60 odd black belt ninjas, at the end of the fight when three charge at him he stops every blow and then takes them out, in the back ground behind them you can see 2-3 blackbelts getting up ready to fight. Suddenly it cuts to the guys blowing away at the door to open it and walk in to find Jet Li gone and the blackbelts all hurt on the floor. The 2-3 blackbelts went from ready to fight to hurt in a matter of seconds, while Jet did his magical disappearing trick once again. Continuity mistake: When Bridget Fonda is stitching up Jet Li's wound, her hair is falling loose around her face. As the scene progresses, her hair is shown neatly tucked behind her ears from different camera angles, then falling loose again on other shots. 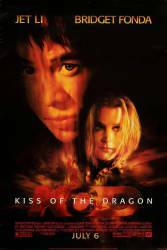 Factual error: The Kiss of the Dragon acupuncture point, known as "Point 15," is in a delicate area of the spinal column, a little below the second cervical vertebra. It's a definite knock-out target in fighting, and it can even be a lethal target. But Jet Li's explanation that it somehow prevents blood from flowing away from the brain is pure nonsense.